last night i made a list of all the things i was going to do today. go to the library, go to harvard square, maybe catch a movie. this morning that list went right out the window as the power of rationalization and the force of sleep usurped my plans. i woke up late (only because i slept late), spent the rest of the day indoors looking outside, enjoying the perfect weather in my own way, that is, eating a lunch consisting of soup from a can and watching the sweet telly. i did however go outside into the backyard for a little bit, my weekend garden inspection. 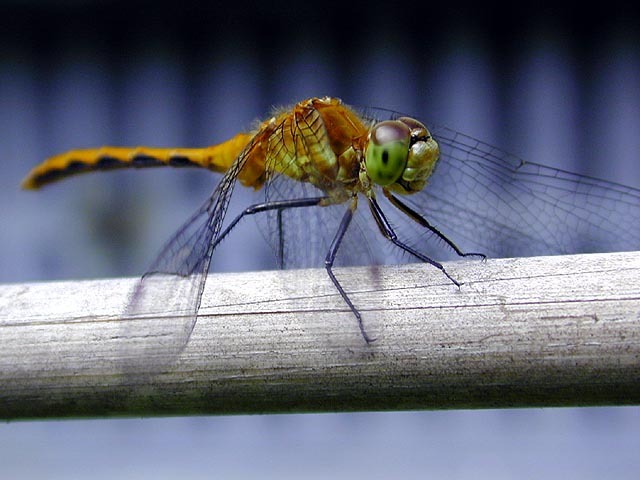 now's the season of dragonflies, and i found a few flying around outside, landing to bask in the warm sun. saw one that i've never seen before, sort of tiger-striped, all yellow/orange with black stripes, with green eyes. it was a photogenic little odonata, staying still so i could get a few good snapshots. my father's day present that i was going to return but lost the receipt for was finally opened today, figured might as well keep the craftsman mechanics tool set, who knows when something like that might come in handy. i suddenly having a craving to take apart large machinery.